Fashion’s purpose is to help you highlight some quality of your inner persona and bring it to the forefront. It allows you to blend into high society by showing off your grace and present that part of you that belongs to the aristocracy. It can let you chill out and display the part of you that is easy going and knows exactly how to go with the flow of the evening. It can reveal your sweet and innocent side or act like a devilish smirk and show that you’ve got a dark and seductive aspect that likes to come out from time to time, too. But, sometimes, you need to find just the perfect outfit to let everyone see exactly what you are made of. Normally, it is considered rather improper to appear to any social occasion revealing too much, but society has changed a lot over the last several decades. Where once the display of an ankle or wrist would be enough to titillate the menfolk and earn the ire of everyone else, we now give only a few extra glances at a bare midriff. And men weren’t immune to the scorn of impropriety, either! But, thankfully, the world has changed. And, now, you can reveal more of yourself than ever—right down to the bone! Do so in style with this Bone Daddy Skeleton Suit costume. The polyester poplin suit jacket features two front buttons and your own skeletal imprint including ribs and arm bones. The matching trousers have your printed pelvis and leg bones and gloves reveal all of those delightful phalanges. Include a few additional accessories—we might recommend a top hat and cane—to raise your esteem further. 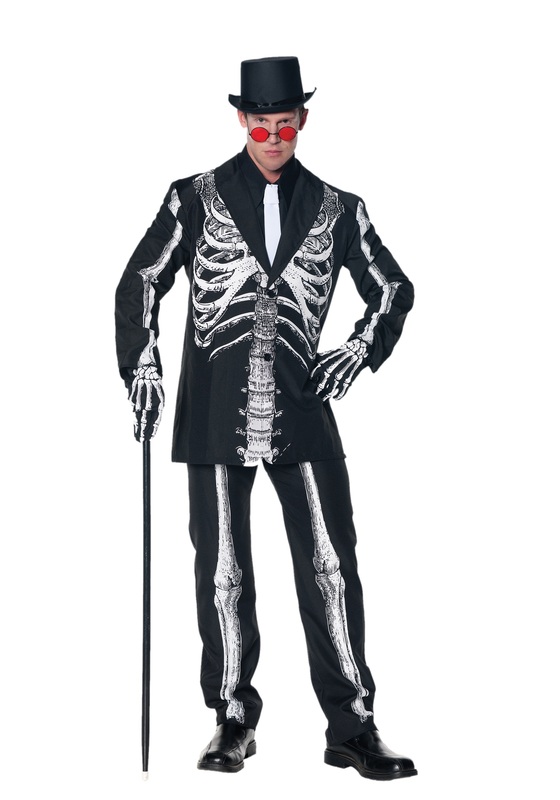 But, either way, you’ll enjoy your night as you dance through the party as the most dapper skeleton your friends have ever seen.